THATCamp Pittsburgh 2018 met this past weekend and was a great success. Thanks to our organizing team (Jessica Benner, Susan Grunewald, Jessica Otis, Abigail Owen, and Emma Slayton) as well as our awesome sponsors (dSHARP, CMU’s Department of History, the Frank-Ratchye STUDIO for Creative Inquiry, and the DHRX). Whether you’re working by yourself or part of a larger team, managing an academic project can take a lot of time and effort, especially when that project involves digital scholarship. This workshop will introduce you to the basics of formal project management including requirements and scoping projects, risk assessment and data management, team communications, managing time and budgets, reviews and exit criteria, and project preservation. Networks are simple formal representations for how the world intermingles with itself. The humanities can make good use of this formalization to study anything from social interactions, to similarities between literary genres, to the trade routes between ancient cities. This workshop will cover the conceptual foundations of network analysis, and the steps to prepare data for, analyze, and visualize humanities networks. Participants will learn on Google Sheets, Palladio, and potentially Gephi. Welcome to National Library Week 2017! 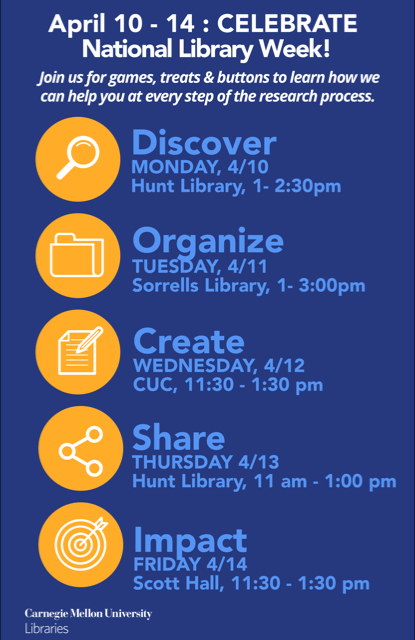 Check out events happening around CMU this week. 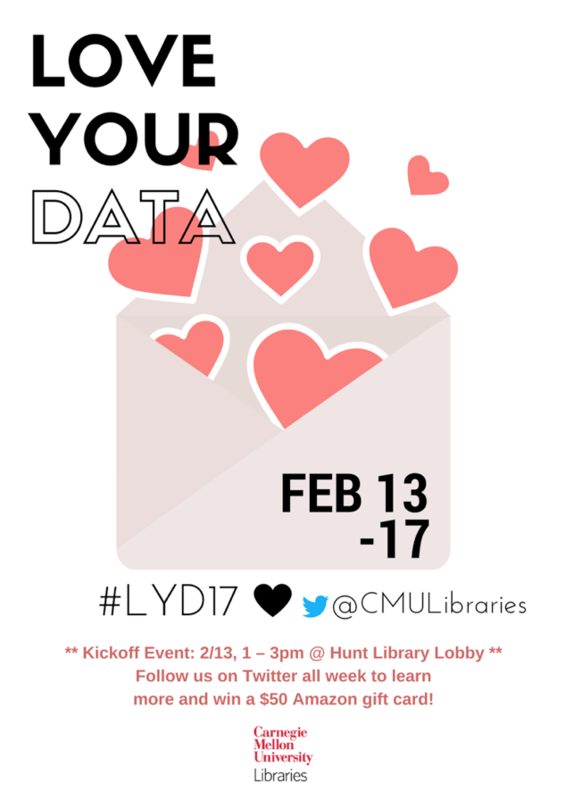 Remember to follow along on Twitter with #LYD17 and check out the @CMULibraries data tips.